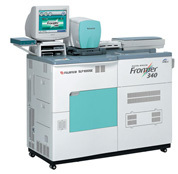 At Fisk Camera Shop, we offer a full range of photographic and digital services using the Fuji Frontier printer and Fuji Crystal Archive paper and chemistry. Print sizes: Wallet, 3.5 x 5, 4 x 6, Panaramic (4 x 12), 5 x 7, 8 x 10, 8 x 12, and sizes up to 30 x 100 availble upon request. Resists fading for generations.... Prints that stay beautiful over time! Digital Media: Compact Flash, Smart Media, SD (Secure Digital), XD, Memory Stick, CD, and more. Film Types: 35mm Color and Black & White negatives, 120 Color and Black & White negatives, Advantix. Old and odd sized negatives welcomed.